If you’re getting all dressed up for a night on the town, you want to make sure you get your money’s worth, entertainment-wise. That’s why you head to the tony Century Room at the swank Hotel Adolphus. Not only is there dining and dancing, there’s also an ice show. Yep, an ice show. 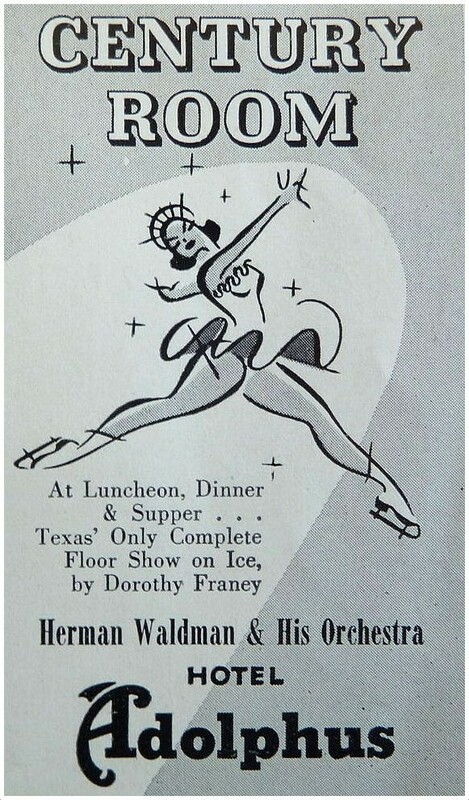 When “Texas’ Only Complete Floor Show on Ice” has wrapped up, a dance floor magically covers the ice, and you and your honey can trip the light fantastic to the fabulous strains of Herman Waldman & His Orchestra. Skates optional. 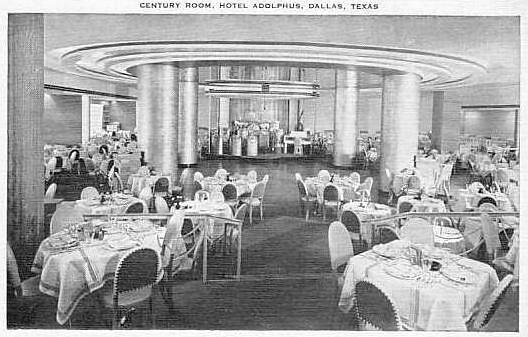 An entertaining page with facts and photos of the Century Room’s many looks and themes over the years can be found here. Just great photos and memorabilia! Thanks so very much for your efforts and presenting these. 1949. Shop Neiman’s. Have lunch at Century Room, Adolphus Hotel. See ice show. Or lunch at the A.Harris tea room, have famous finger sandwich luncheon plate, watch style show as models sashay through. Go to movie at Majestic. See organ rise from floor! Bob Hope was there promoting Sorrowful Jones. Another Dallas memory: the Freedom Train and President Harry Truman on the same day.VERY COLD DAY. Freedom Train carrying historical documents…..the US CONSTITUTION and probably the DECLARATION of INDEPENDENCE…on railroad siding at FairPark. EVERY school child in north Texas braved the cold and stood patiently in line for hours to view the national treasures. A motorcade carrying President Harry Truman was there..perhaps Pres.Truman made an appearance at the Adolphus.